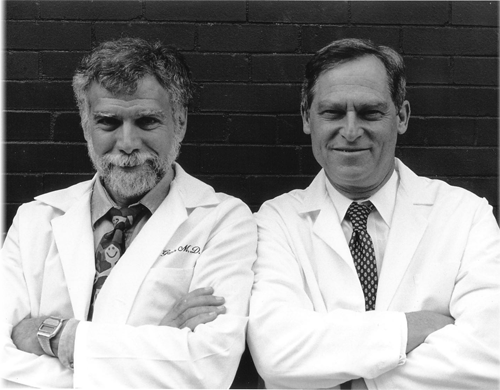 Greg LaGana, M.D., and Barry Levy, M.D., both graduated in 1971 from Cornell University Medical College, where they wrote and participated in three of their annual class shows (musical comedies). They renewed their collaboration in courses on Writing for the Musical Theater in 1994-1995 at the New School for Social Research in New York. They wrote and first performed Damaged Care for their 25th medical school reunion in 1996, and have since updated the show and performed it many times across the United States. Greg completed an internal medicine internship and residency at Harlem Hospital, and is board-certified in internal medicine. He has worked as a field director for a pediatric nutrition program in Jamaica, a medical educator, an occupational physician for three pharmaceutical corporations, and director of emergency services for both inner-city and suburban community hospitals. He has designed, directed, and owned urgent-care centers. Greg also co-founded Pegasus Consulting Associates, a strategic management consulting firm, and ARK Technologies, an entrepreneurial think tank exploring the impact of computer and telecommunication technologies on health care. Greg's passion for performing began as an amateur magician in grammar school. He has performed in numerous musical comedies in amateur theaters and played the lead roles in Henry the Fourth, Part I, and A Man For All Seasons. He also plays piano and electric keyboards with the BassBoards, a rock and blues band that he co-founded with his cousin in New Jersey (www.bassboardsmusic.com). Barry completed an internal medicine residency at University Hospital and the Beth Israel Hospital in Boston, and a preventive medicine residency at the Centers for Disease Control. He is board-certified in internal medicine and occupational medicine. He is a consultant in occupational and environmental health and an Adjunct Professor of Public Health at Tufts University School of Medicine. He previously worked as a medical epidemiologist with the CDC, a professor and director of the occupational health program at the University of Massachusetts Medical School, as an international health program director, and as executive director of the International Physicians for the Prevention of Nuclear War. In 1997, he served as president of the American Public Health Association. Barry has written many papers on occupational health and public health issues, and has co-edited books on occupational and environmental health, war and public health, terrorism and public health, and social injustice and public health. Brad Ross (Musical Director and Composer of Original Music) is a composer, songwriter, and pianist. Last year, his symphonic story, A Family for Baby Grand, was performed by the National Symphony at the Kennedy Center. It has also been performed by the Philadelphia Orchestra, the San Diego Symphony, the Jacksonville Symphony, and many other orchestras. Brad's musical The Tales of Custard the Dragon was commissioned and produced by the Kennedy Center. His music has been broadcast on CNN, PAX TV, and the Learning Channel. His musical Little By Little was produced Off-Broadway at the York Theater. The original cast recording was released on the Varese Sarabande label and the show is licensed by Samuel French. His songs are published by Hal Leonard Music Corporation. His symphonic adaptations of Ogden Nash's Custard Books have been performed by the Milwaukee Symphony, the Charleston Symphony, the New Haven Symphony, and the Queens Symphony with the Big Apple Circus. He composed the music for the acclaimed musical The Times (written with Emmy award winner Joe Keenan of Frasier), which won a Richard Rodgers Development Grant and was presented in New York last year. Michael Schiralli (Director): Vendler Television Playhouse; Holiday Ham; Enough About Me (GLAAD-nomination, Best Off-Broadway Musical); The Very Worst of Varla Jean Merman (NY/London/LA, Theater West Award); Janeane Garofalo & Strangers; Miss Coco Peru Is Undaunted (2004 GLADD nomination, Renberg Theater); Valentine's Day Massacre; Nothin's Easy and Nobody's Happy (MTW, HBO Workspace); The Impersonation (Greenwich St. Theater); Gas, Food, Talent (West Bank Theater) ; True Love (NY, LA); Songs for a New World (HHPAC). He directed MAC Award winners Jennifer Kruzkamp, Lisa Asher, Alex Haas, Seth Rudetsky, Baronne and the Bon Bons; MTW's Holiday Extravaganza; and segments for HBO's Anything But Standup, Toyota Comedy Fest, and projects at Caroline's, Westbeth, HERE, and Irish Rep. Workshops: Laura Nyro Project; Medium At Large; Jackie Hoffman: Live at Joe's Pub - If You Call This Living; and Inside The Blue Hole; Under a Big Top; Tower Of Babble (2003 NYC Fringe Festival); and Merce Cunnigham's 50Th Anniversary Gala.